A tree commemorates the centenary of the granting of the first mining lease in Tottenham in 1903. In March 1903, Harry Fishpool discovered a copper lode on the 80 acre mining lease at Orange Plains Station that had been acquired by a Cobar entrepreneur, William Shallalah. This mine became known as the Mount Royal. Other mines operated in the vicinity such as the Bogan River, the Caroline, the Chris Watson, the Ace and the Iron Duke. The Mount Royal Mine was reportedly the deepest and most productive in the area. Harry Fishpool sold his interests in the Mount Royal to a Sydney syndicate in 1907. Mount Royal Copper Mine, the first mining lease at Tottenham, was granted to Harry Fishpool, October 1903. 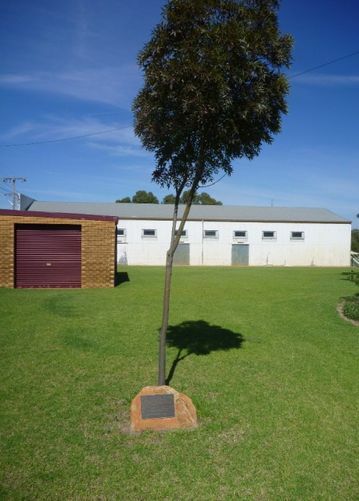 His great grandson, Geoffrey Fishpool and great, great, great granddaughter, Naomi Fishpool, planted this tree on 19 April 2003 to celebrate this centenary. Mount Royal Copper Mine, M.L. 59, Parish Beaconsfield, County Kennedy, 48 miles from Trangie Railway Station and 8 miles form the surveyed Bulbodney Railway Line.